The journey from London, situated in England and Oxford, which is in England is well served by trains. The trains are operated by the following rail companies: Great Western Railway. Using the train is a fast and convenient way to get to Oxford from London. 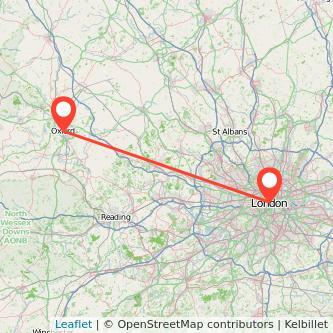 The average journey duration between London to Oxford is 1h03m to travel the 52 miles. We found tickets from £5.40 to travel in the next month. Prices can vary depending on when you travel or how long in advance you buy your ticket. Find the cheapest tickets to travel from London to Oxford by train, bus, ride sharing and plane. The Prices for train tickets London to Oxford tend to increase the closer you get to your departure day. Based on our data, if you purchase your ticket 1 month in advance, the price of the ticket starts at £6 whereas when booking on the day you're travelling, you will need to spend at least £20 for your trip. Thus, you will save 71% on the price of your ticket by buying your ticket 1 month in advance as opposed to on the day you're travelling. We compare train ticket for all major companies to travel between London and Oxford by train and find the best prices for the coming days. Take a look at the prices of train tickets Oxford to London and find the best deal for your outbound journey. National Railcards can save you a lot if you're using the train. Depending on your age as well as your situation, you are able to get one of the 5 different railcards: Disabled persons, 16-25, Two together, Senior or Family and Friends railcards. Railcards can enable you to pay less for your London Oxford train ticket. To understand the savings that you can make with a railcard, you need to calculate how many trips you need to make earnings. You will see that commonly only a few trips are needed. For your calculation, you must include the railcard cost, for instance £30, the discount on each trip (i.e. : 34%) and the cost of your ticket. The average cost of a London Oxford ticket is £17.49 (1). Divide the railcard cost by the saving: £30/34%= £88. Now divide £88 by £17.49: £88/£17.49 = 5.03. It will take you on average 6 trips from Oxford to London (one way journey) with your railcard to start saving money.